At homes4u we pride ourself on our award winning services and are pleased to have been recognised at several industry awards. November 2016:- Shortlisted for Letting Agent of the Year Landlord and Letting Awards. June 2016:- Best Social Media Gold Award at The Lettings Agency of the Year Awards 2016 in association with The Sunday Times and The Times and sponsored by Zoopla Property Group. October 2015:- 'Highly Commended Letting Agents Manchester' at The International Property Awards United Kingdom. November 2013:- Finalist Letting Agent of the Year Landlord and Letting Awards. 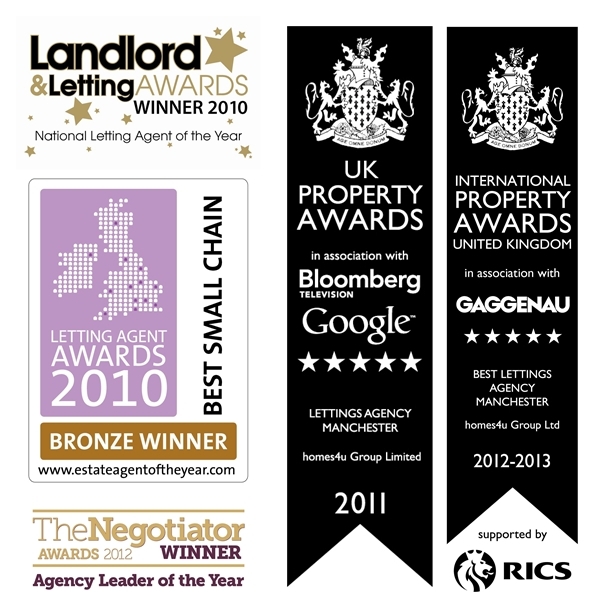 2010:- National Letting Agent of The Year 2010 at The Landlord and Lettings Awards. 2010:- Bronze Winner Best Small Chain at The Estate Agency of the Year, Letting Agents Awards.